THE CANADIAN PRESS -- BERLIN - In a surprising U-turn, German officials said initial tests published Monday provided no evidence that sprouts from an organic farm in northern Germany were the cause of the country's deadly E. coli outbreak. The Lower-Saxony state agriculture ministry said 23 of 40 samples from the sprout farm suspected of being behind the outbreak have tested negative for the highly aggressive, "super-toxic" strain of E. coli bacteria. It said tests were still under way on the other 17 sprout samples. "The search for the outbreak's cause is very difficult as several weeks have passed since its suspected start," the ministry said in a statement, cautioning that further testing of the sprouts and their seeds was necessary to achieve full certainty. Negative test results on sprout batches now, however, do not mean that previous sprout batches weren't contaminated. The ministry statement about samples from the Gaertnerhof organic sprouts farm in the northern German village of Bienenbuettel left consumers across the continent still puzzled as to what is safe to eat. The ministry itself also said it was not clear how soon an answer would be found. "A conclusion of the investigations and a clarification of the contamination's origin is not expected in the short term," the ministry added. The current crisis is the deadliest known E. coli outbreak, killing at least 22 people and sickening more than 2,300 across Europe. Suspicion for the cause of the E. coli outbreak had initially fallen on contaminated cucumbers from Spain, but researchers then concluded that the cucumbers were contaminated with a different strain of E. coli. German authorities on Sunday issued a warning against eating any sprouts and kept up their earlier warning against eating tomatoes, cucumbers and lettuce. In Germany alone, 2,231 people have been infected since May 2, with 630 of them suffering from a rare, serious complication that can lead to kidney failure, Germany's national disease control centre said Monday. That centre, the Robert Koch Institute, said the number of serious complications was ten times the number of cases registered for all of 2010. Preliminary epidemiological tests had found that sprouts from the Gaertnerhof Bienenbuettel farm could be traced to infections in five German states. Many restaurants had received deliveries of the sprouts, which are often used in mixed salads. 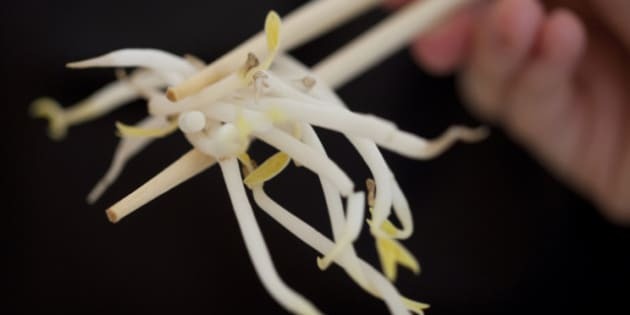 Sprouts have also been implicated in previous E. coli outbreaks, particularly one in 1996 in Japan, in which tainted radish sprouts killed 12 people and reportedly sickened more than 9,000. E. coli is found in the feces of humans and livestock and can spread to produce through sloppy bathroom habits among farmworkers or animal waste in fields and in irrigation water.